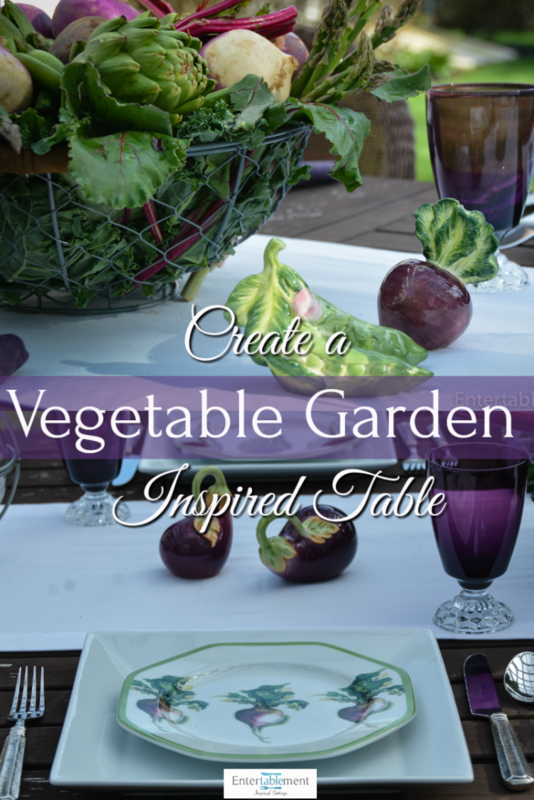 Vegetables make wonderfully colourful centrepieces, with or without inspirational plates to go with them. Vegetable Garden by Williams Sonoma appeared briefly in 2001 and was shuffled off this mortal coil quickly thereafter. 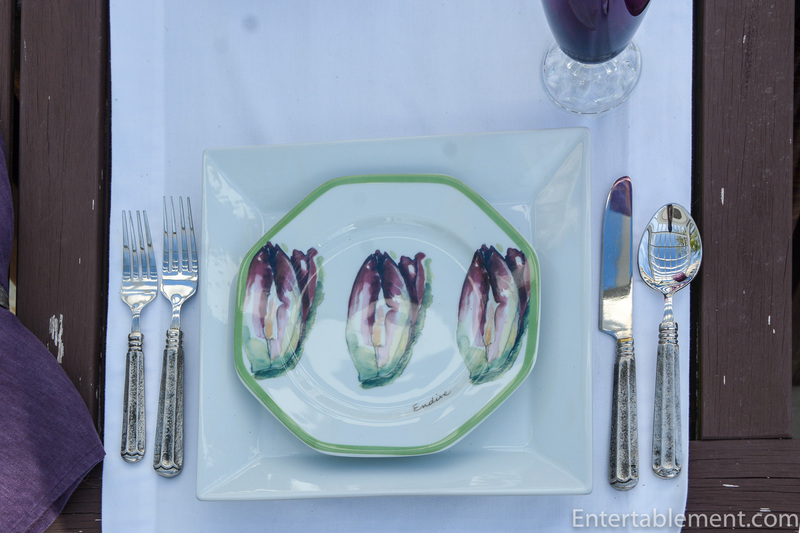 I was lucky enough to find this set of six salad plates on eBay recently for the princely sum of $10. Who could resist? I fell for the unusual octagonal shape with the pale green border, and the vibrant greens and purples that comprise the vegetables. They gave me another excuse to use vintage American Lady amethyst glasses by Fostoria. Woot! A purple-letter day. There are six plates in each of the 8″ salad and 6.25″ octagonal canapé sets. 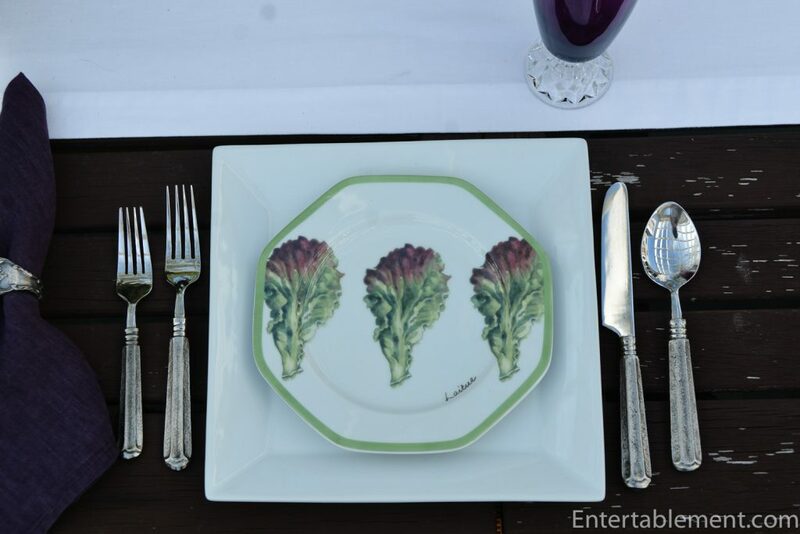 The salad plates feature three of each vegetable; the canapé plates have one large illustration. Here we have Green Peas (with a touch of purple, it seems). Of course, I had to find salt & peppers to go with them. I couldn’t believe my luck with these Fitz & Floyd Pea Pod and Turnip Salt & Pepper shakers, also from eBay, also $10. Aren’t they adorable? While I was searching for vegetable salt & peppers on eBay, three sets came up for a total of $8 – eggplants, onions/garlic? and corn. 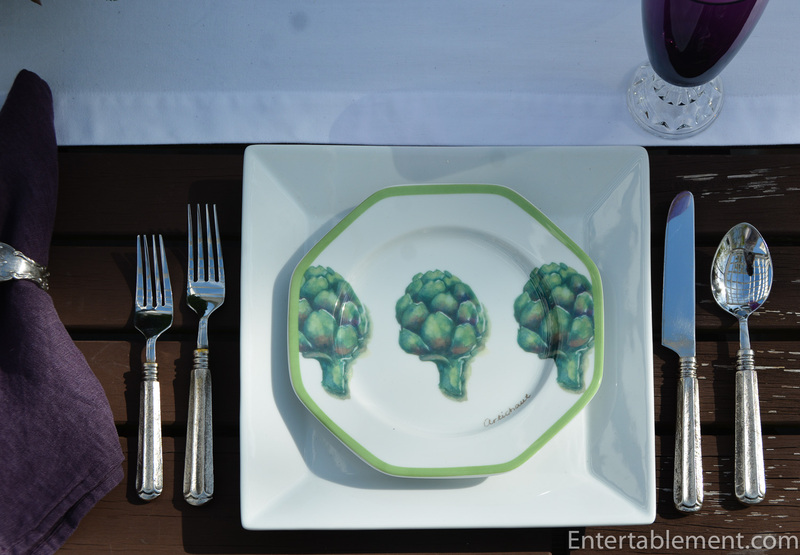 Stay tuned for the latter two sets in future tablescapes. Eggplants fit the purple theme here, so they got a day out. 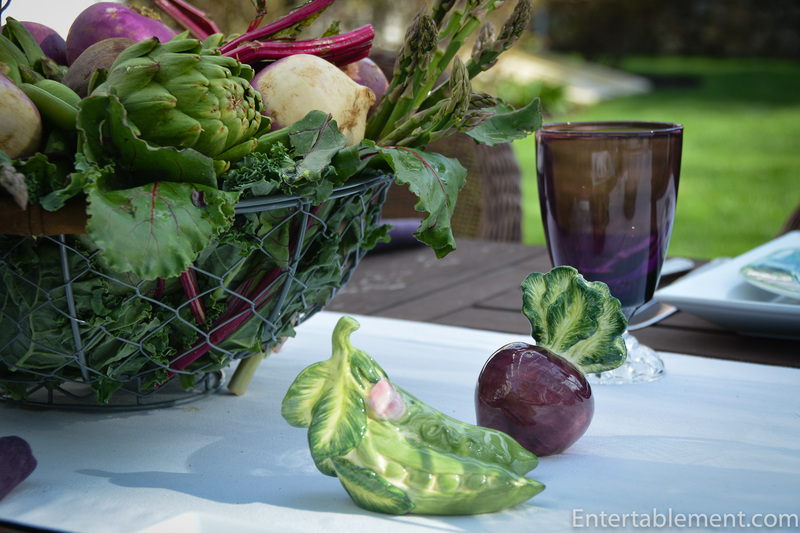 After that, it was just a matter of arranging a bunch of vegetables in a wire basket and voila. Instant centrepiece. 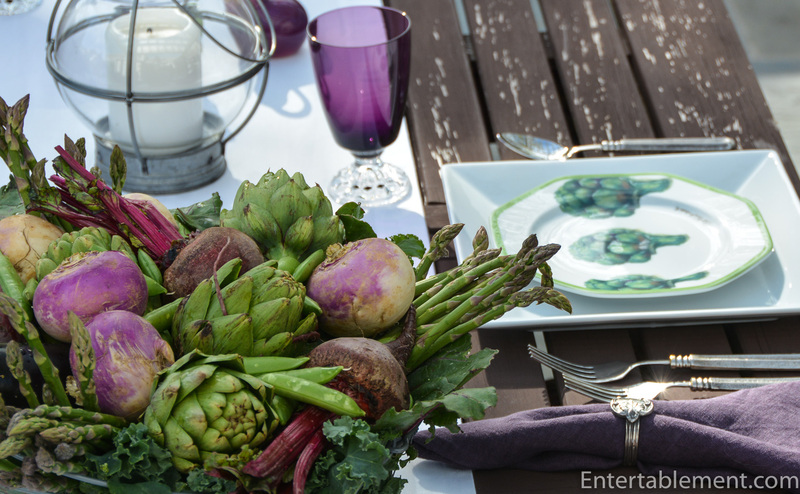 Vegetable centrepieces are also practical; you can eat them afterwards! Or if you have a Golden Retriever named Churchill, you may find he has beaten you to it by snarfing back the raw beets while your back was turned. Yes, it was as ugly as it sounds. Not only were his paws and the carpet where he held and consumed said beets a bright magenta, his digestion showed evidence for days. Not pretty! I did manage to get the beet stains out of the carpet, however. Carbona Oxy-Powered Carpet cleaner is truly a miracle worker. I can highly recommend it. Anyone with multiple Goldens is aware of their digestive propensities: they eat absolutely anything and it inevitably emerges at the most inopportune times. 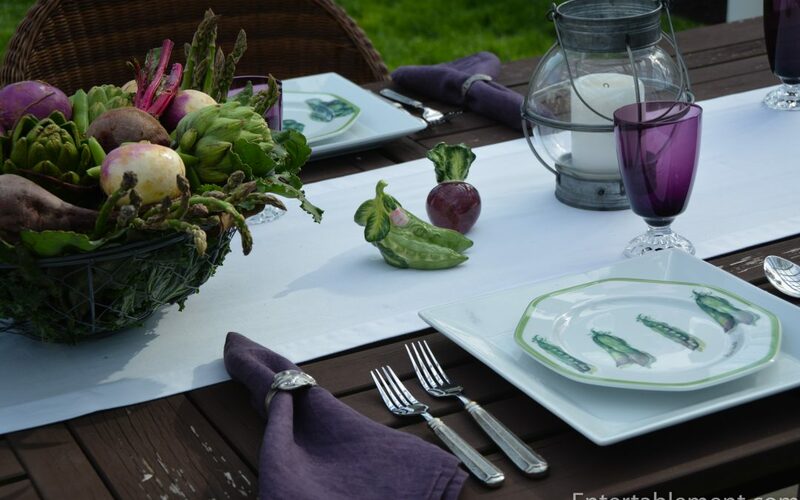 I got these washed linen purple napkins from Williams Sonoma on sale a bunch of years ago. At first I wasn’t sure about the “washed” look; they were messy and unkempt to me. 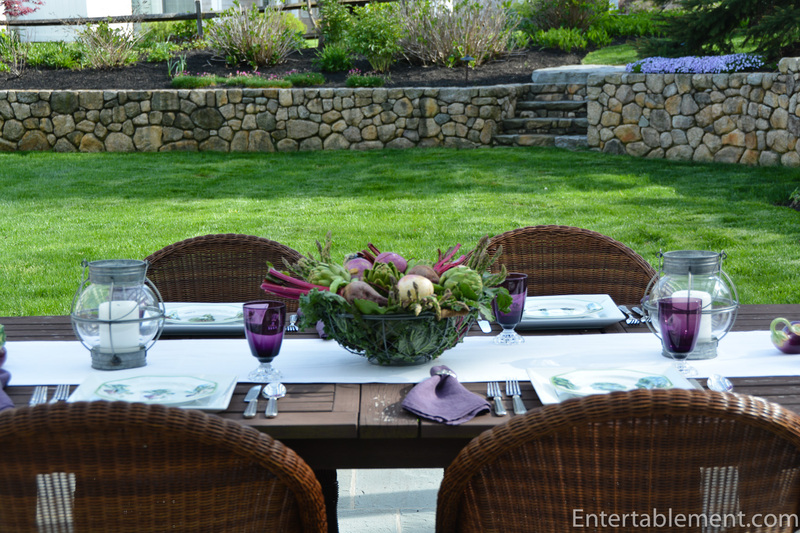 But I’ve come to love them, especially with casual tablescapes like these. 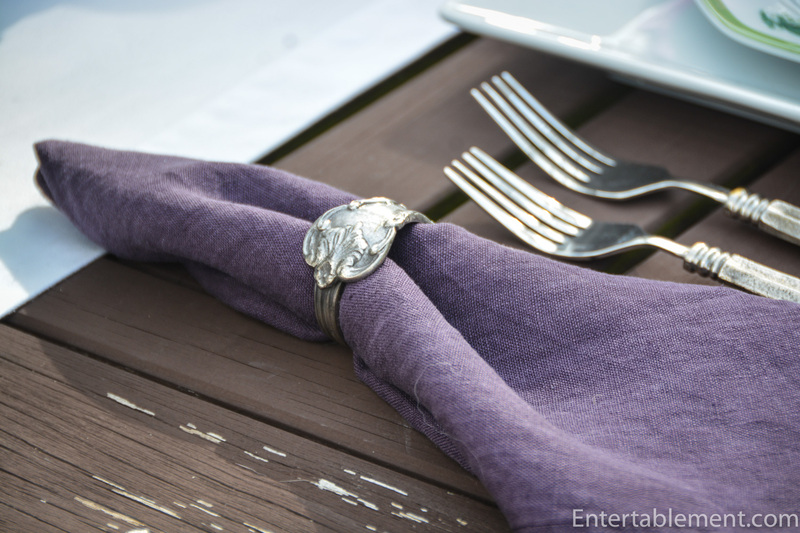 Galvanized candleholders picked up the silver tones in the Danieli flatware from World Market. And that’s a wrap! A vegetable wrap. Hehe. It’s Friday! A cloudy day here on the Cape which should give me some time to catch up on photo sorting and processing, probably the bane of any photographer/blogger’s existence. I’m gradually getting more familiar with Lightroom and that’s helping to speed things up. There is always so much to learn! Enjoy your respective weekends, dear Readers. I hope the veggies in my garden look like this some day after a very late start on the cape. Cool and unusual plates and all the purple accessories pull it all together. A true feast for the eyes and palate. Hoping to dine together next week. Happy weekend. It’s a late start everywhere, isn’t it? My hydrangea look like they’re still in the deep freeze! Yes to dining next week 🙂 Can’t wait. 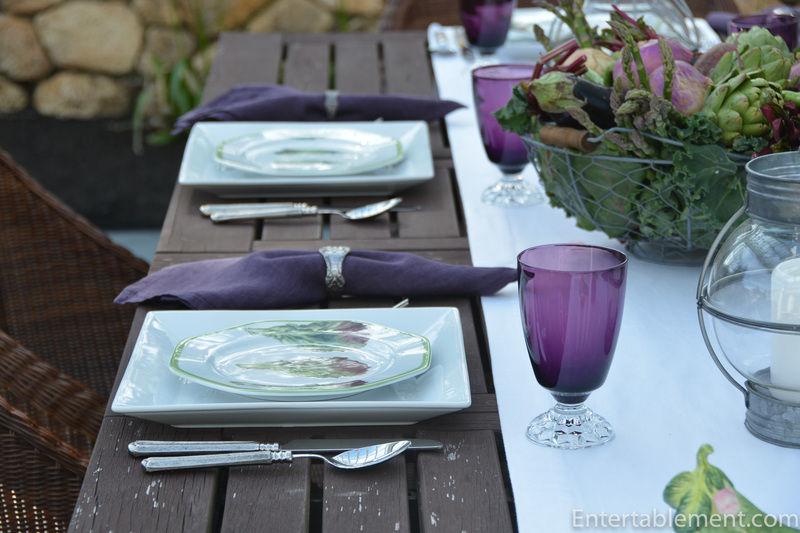 I’ve always loved purple on the table, and I used it for last Christmas Eve dinner with lots of silver and crystal. 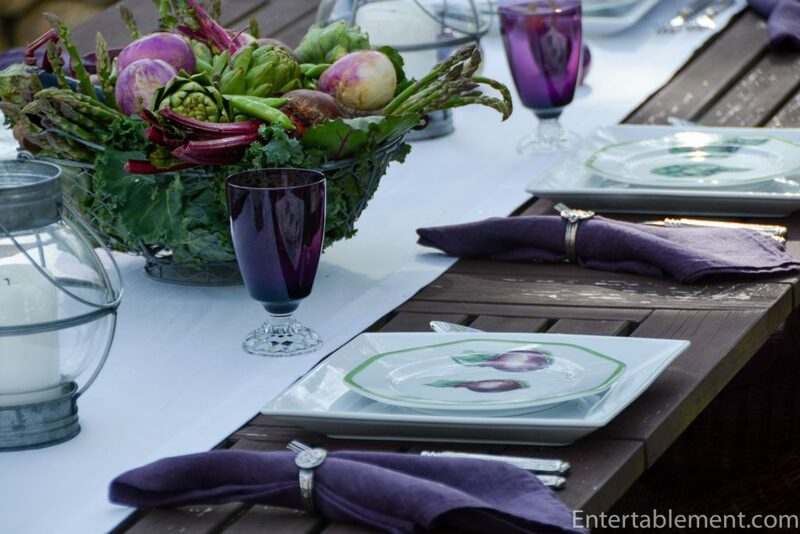 Found very pretty wavy-edged purple serviettes at Z Gallerie on sale. 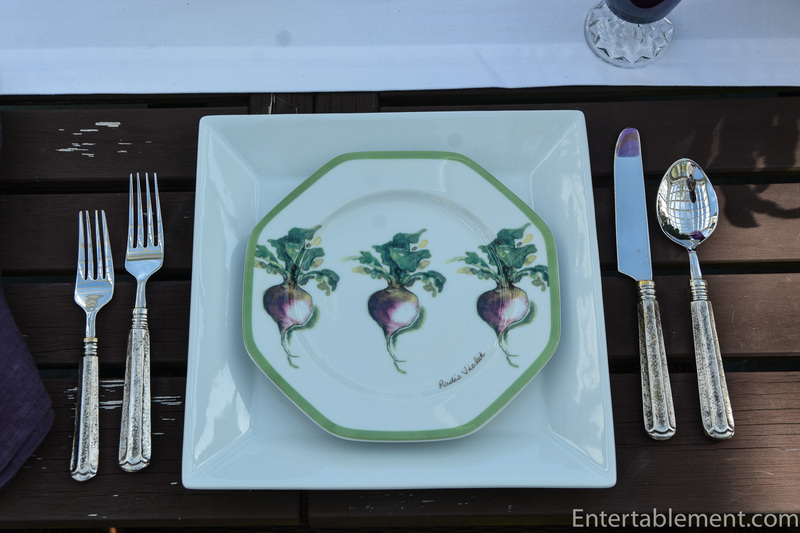 Lucky you with those plates; not so much with the beets. Oxalis is high in beets and can make dogs sick if they eat enough. I hope Churchill (oops, I almost called him Chamberlain!) learned his lesson. The hydrangeas suddenly came alive here and are showing just the cream-purple of your table. 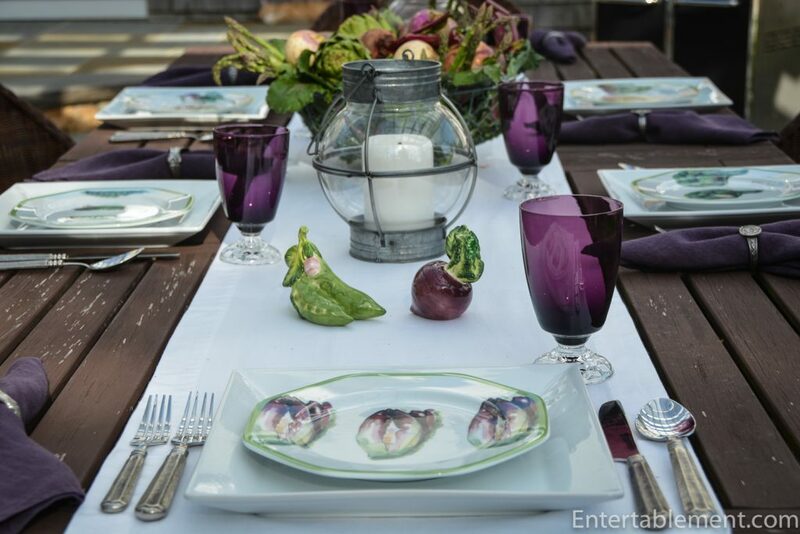 I envy the calm of your setting–we tore out the ceilings the other day, and after a day of hard work I have to find one ounce more energy to set the table as if we were civilized..
Purple is fast becoming one of my very favourite colours for the table, especially for glassware. I think the Royals knew what they were about. Churchill does indeed exhibit Chamberlain qualities; he fancies himself the alpha dog, but we all know it’s Taylor, his much older sister. She just metaphorically rolls her eyes at his pretensions. Dare I ask why you tore out the ceilings? A leak? Have a good weekend, and please get some rest! 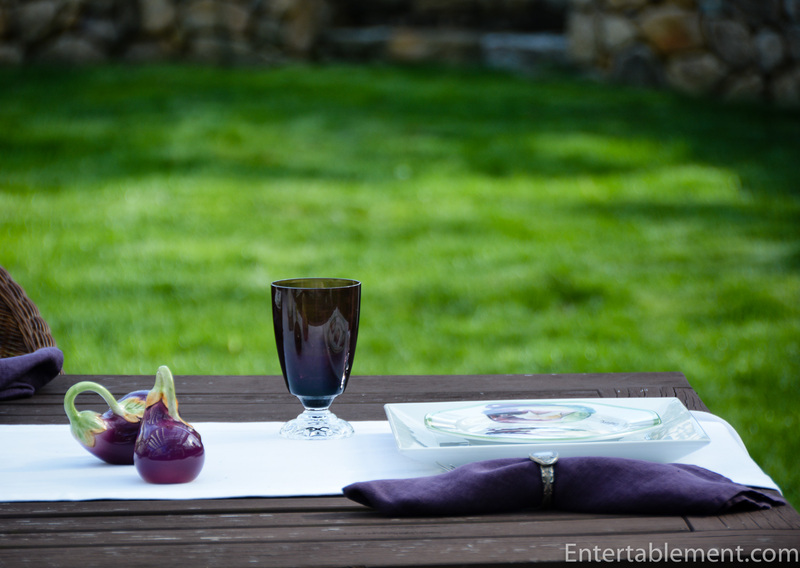 A while ago I said I’d love to see a “virtual swap meet” for extra tableware…glad to see there are some in agreement…anyone have 4 amethyst glasses?? I’d be willing to swap for some green Deco antique Haviland! Let me get my thoughts together on the swap meet and I’ll get back to everyone! Another beautiful table from you, another case of “must find those” for me. Just when I had packed up all my amethyst glass for a trip to Good Will or Salvation Army. The dog and his diet story was alternately horrifying and hilarious. I so look forward to your posts. Thank you. Thank you for visiting and weighing in, Elizabeth. You’d think after a lifetime of owning Goldens I’d know better than to leave things on the counter, but it honestly never occurred to me that the little blighter would fancy beets. Beets! I ask you! Enjoy your weekend. It’s so lovely to hear from you. 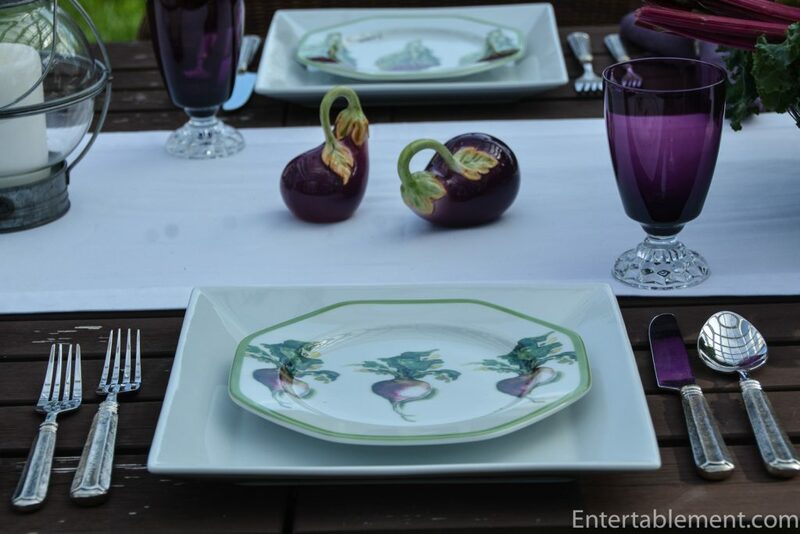 Love the purple and the plates were certainly a good deal. I am starting to collect more purple. Not happy with painted glass. I still think instead of donating plates and crystal to thrift shops, we should just mail it to someone who will love it for the price of postage. Painted glass can be nice, but all too often the paint flakes off. It is NOT dishwasher friendly. Funny you should mention mailing thrift shop donations to a happy recipient for the price of postage; a similar idea had occurred to me as an adventure for tableware fans. We could have a swap! Wouldn’t that be fun? We’d have to figure out logistics, but surely we could arrange some kind of online registry. At least the donor would know it was going to a good home! Once in awhile I see one plate or glass at the thrift/antique shop knowing somebody would like to have it to fill in a set. It hurts my ‘bat guano collector’s” soul when they mishandle things and chip them. Plate hangers also cause a lot of damage. Giving them to someone who would drool over, I mean love them, for another decade is certainly better than donating them. You could put up a “I need this piece” list too since we are often in thrift shops. Let me know when to register. You are so right about plate hangers. They put tremendous strain on a plate. Let me give some thought to how we might do this. We have such a great community of tableware fans; some accumulating and others distributing! Thanks for dropping in, Myrna! You know this is exactly how Replacements got started. And as for all that purple glassware, you better believe that I speedily went to the car and dragged that box back into the house after seeing Ms. Kain’s table. Just need to find the dishes now. As for plate hangers, you are so right. Those old wire spring and hook contraptions are the devil on the delicate edges of plates. I love plates on walls, my guest full bath is almost wall papered in white milk glass calling card receivers . I rely on a product from The Flatirons Disc Co. of Niwot, Colorado. They sell adhesive plate hangers, made in England, in 5 sizes, the largest of which will hold up to six and a half pounds. They stick to the back of the plate, can be cut to an unusual shape if necessary and are easily removed with hot water when desired. My love affair with all the things that make a beautiful table is an enduring one, but it took a deep dive when I lost husband of 38 years and my 102 year old mother within 4 days in 2015. With the death of my sister in law not a year later and the permanent move to Vancouver of my dear daughter, my family was down to me. I made the logical downsize and move from a very urban area to a quieter more rural location and in despair I gave away or sold most of my tableware – and there was a lot as you can well imagine. I am still sorting, giving away or throwing away, some things are just not meant to be kept. When I settled into my, new to me home, I connected to the internet, found Between Naps on the Porch and the nirvana for dish lovers, Entertablement. The first post of Ms. Kain’s that I read was about her grandmother’s charming tea set. Kindred spirits! Love affair rekindled! I moved with 4 sets of dishes on July 5, 2016. I now have 12 finished and 4 in the gathering stages. i will soon reach pre nightmare proportions. Sick. Oddly, though I thought my entertaining days were over, I find that lonely old ladies love to be entertained and find great pleasure in being treated to even a simple sandwich seated at a table which shows some effort has been made. Next up for me is a Midsummer’s Eve Dinner served on my Norwegian Figgjo Flint Turi Tor Viking which I collected when I was young and single in the late 60’s and early 70’s. Salmon, herring, reindeer sausage and Akvavit will make for a jolly time. 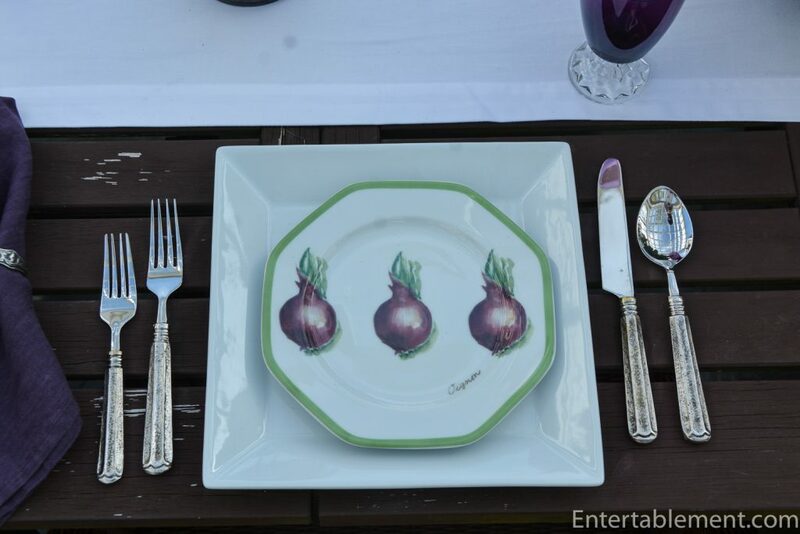 Your community of tableware fans has returned me to an interest in life outside myself. You ladies (and gentlemen) do more good than you know. I say gather some plates, lay a pretty table, call your friends, make new friends and enjoy the life you have left over a pretty plate willed with good food. Thank you Ms. Kain, Susan of BTNP and all the rest. Let me know what you are looking for and I will keep weather eye out. Ms. Speicher, I am overwhelmed with your response. If I ever wondered what purpose Entertablement serves, you have answered it in spades. Thank you so very much telling us about how you came to fall in love with tableware, go on hiatus while navigating a series of terrible losses, and then finding your way back to enjoyment of life including beautiful tables. You’ve clearly shown enormous courage in wending your way through the reshaping of your family and relocating your home. Any one of those things are a tall order; clumped together it’s extraordinary undertaking. I’m now intrigued to know which patterns comprise your twelve completed and four “in progress” sets! There’s nothing I love better than styling a pattern, mentally, virtually or physically! And with storage boxes or cabinets like Susan from BNOTP has put into her garage, the nightmare can be kept firmly at bay. Keep on collecting is my motto! Thanks also for the tip about the adhesive plate display product. I’ll make sure to track it down and highlight it in an upcoming post on organizing and storing a collection. 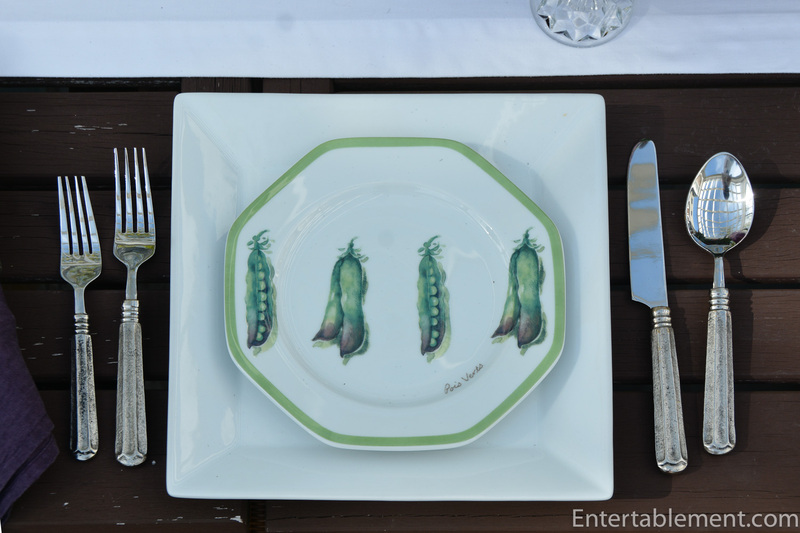 What a endearing story and tribute to the wonderful Mrs. Kain and her beautiful dishes. Last year I lost 3 family members in four months. I feel your pain. As a senior citizen, I have no problem treating myself. I don’t need company to love my dishes and other “pretties” I believe there is a blog called Table for One, but at the moment, I can’t find the one I found thru Between Naps On The Porch. You can’t believe the friends I have made shopping at GoodWill while looking for china and glass. It is a common bond just like the ones online. May the sun shine on all of your pretties Elizabeth. I’m so sorry to hear about all the losses in your family, Myrna. Three in four months is a terrible blow. We are very lucky to have this community of “pretties” lovers, aren’t we Myrna? Whether online or browsing in bricks and mortar shops, finding like-minded people is the best part. The loss of a loved one is a terrible thing, Then to have another and another before you can adjust is devastating. I have some understanding of what you have been through and what you must still be going through. Know that the next time one of those unexpected waves of longing and despair washes over me I will ask that comfort and acceptance be given to you as well as myself. Thank you for the kind words. I have a question. 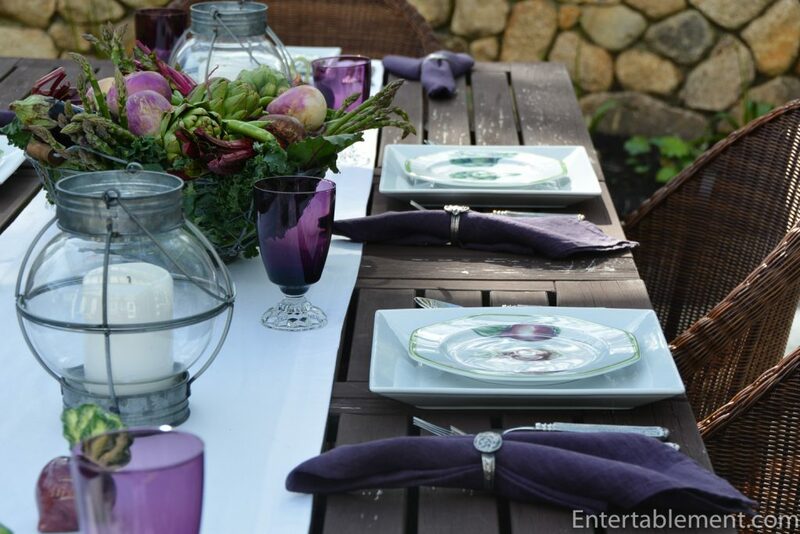 Some amethyst looks purple like the table setting, but then there is another that looks almost brown. Does it have another color name? I have a friend who will be selling her Majolica collection if anyone is interested. That particular goblet is American Lady Amethyst (Stem 5056) by Fostoria, produced between 1948 and 1964, according to Replacements. I’m not aware of any other name. It is a very clear, deep purple, so I suspect the photos where it looks different are due to the light. 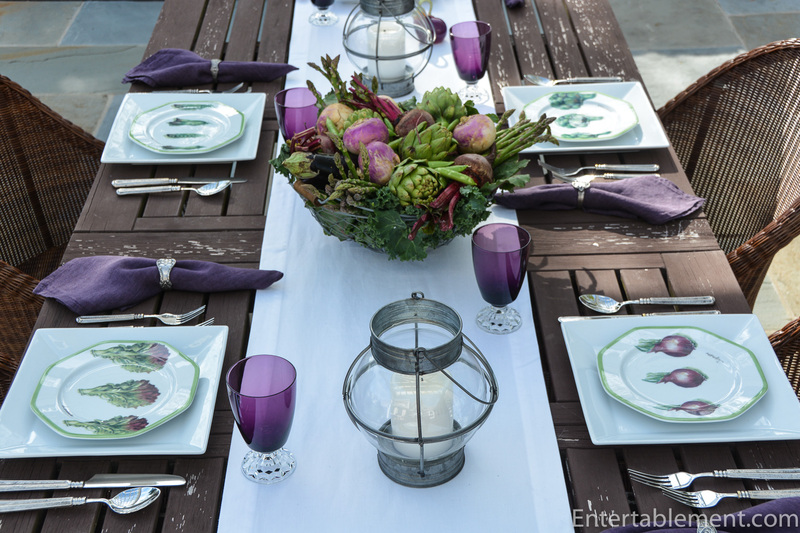 Purple is tricky – it can lean towards red or blue. I favour the bluer shades, but everyone has their own preferences.